There is a special magic to gathering together several generations of a family under one roof. 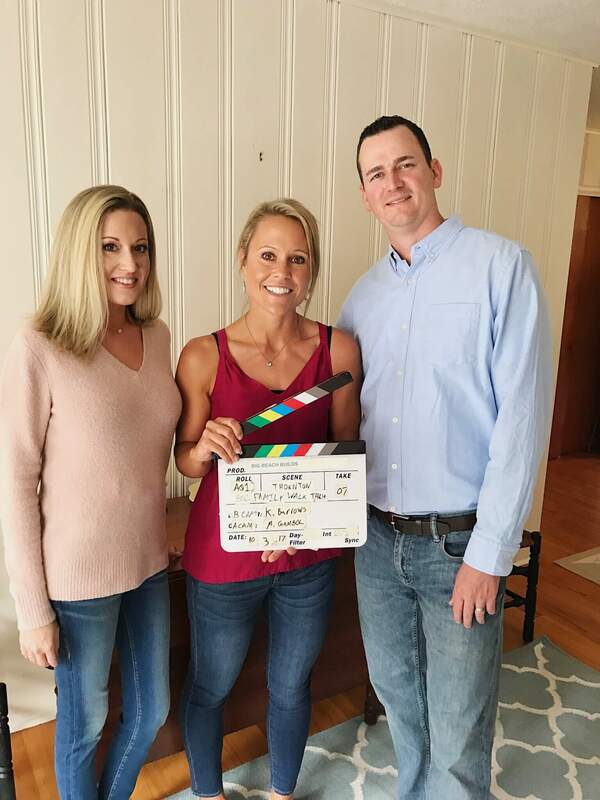 For my clients Dade and Jodi, the beach home in Fenwick Island, Delaware that they own with their extended family holds many years of happy memories. The only problem is that, as the family continues to expand and more little ones join the festivities, the house has stayed the same size! 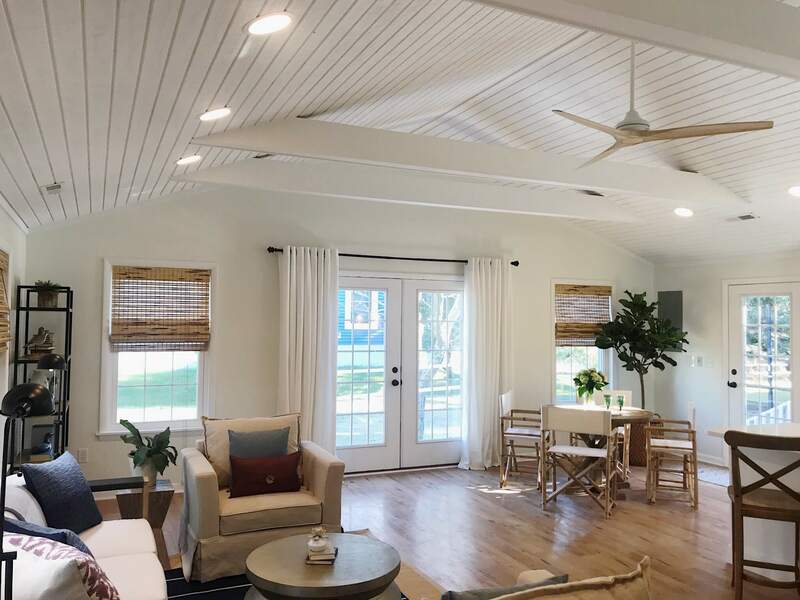 Dade and Jodi loved the cozy cottage feel of the house, which sits just 100 yards from the water, but they needed a bigger and more functional space. They asked me to help upgrade their home to meet the needs of their growing family, while still holding onto its warm, welcoming character. With some smart space planning and a few strategic renovations, we created an airy home that has room for everyone – now and in the future. The great room should be a central area where the whole family can spend time together. But the original great room was too cramped to accommodate everyone comfortably. The awkward floorplan didn’t make the best use of the square footage, and a rarely used fireplace sat right in the middle of the room – closing off the space and taking up valuable real estate. 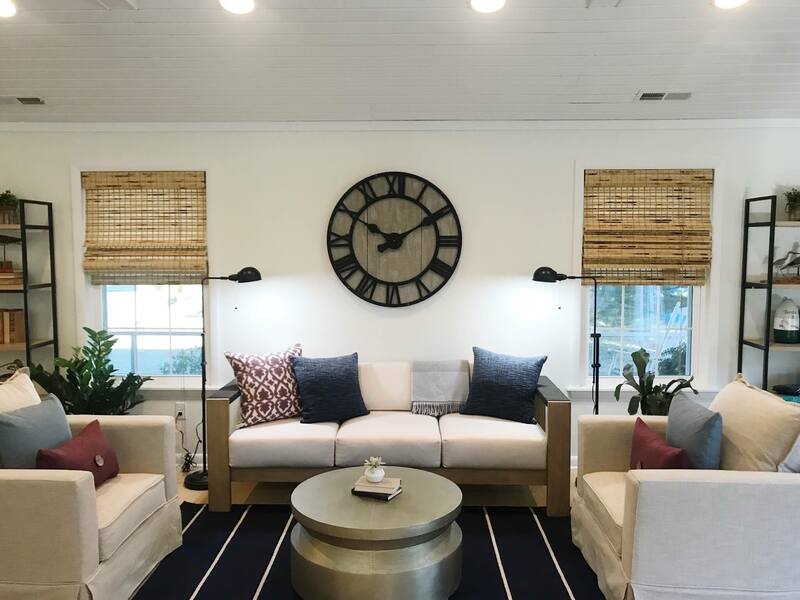 I opened up the great room to make it more social and inviting, creating an area where the family will want to hang out. I knocked down the fireplace wall to increase the size and even out the shape of the new great room. 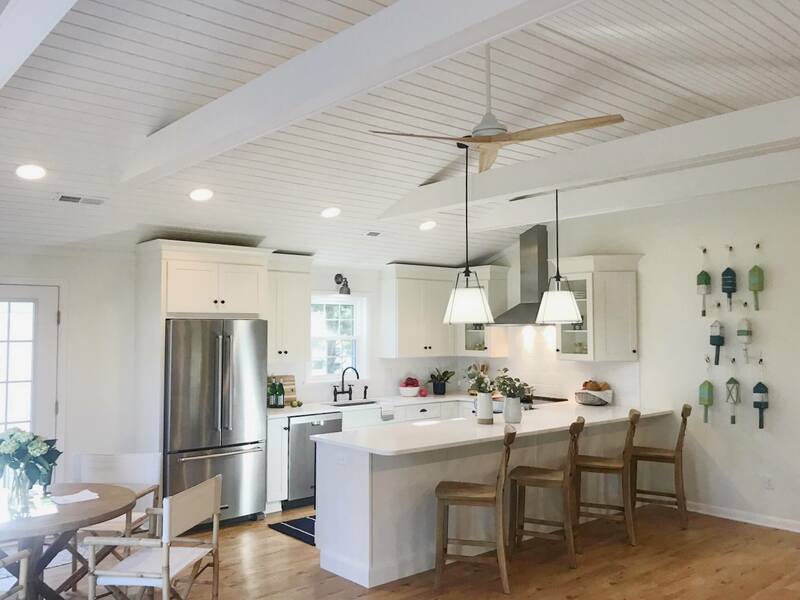 To bring in lots of natural light and make the room feel even more spacious, I vaulted the ceiling with white wood crossbeams. I also added new windows, entry doors and French doors. Clean white and blue furnishings completed the makeover, transforming the great room into a fresh, modern gathering place. Partially hidden in a corner behind the fireplace wall, the kitchen was dark, outdated and nearly forgotten. 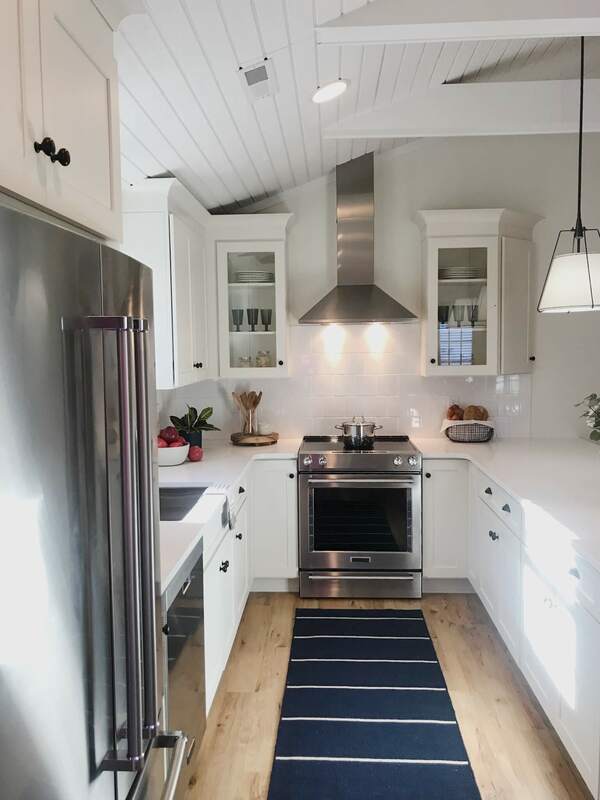 Its small, crowded layout wasn’t conducive to preparing family meals, and its dark cabinets and worn flooring were crying out for an upgrade. 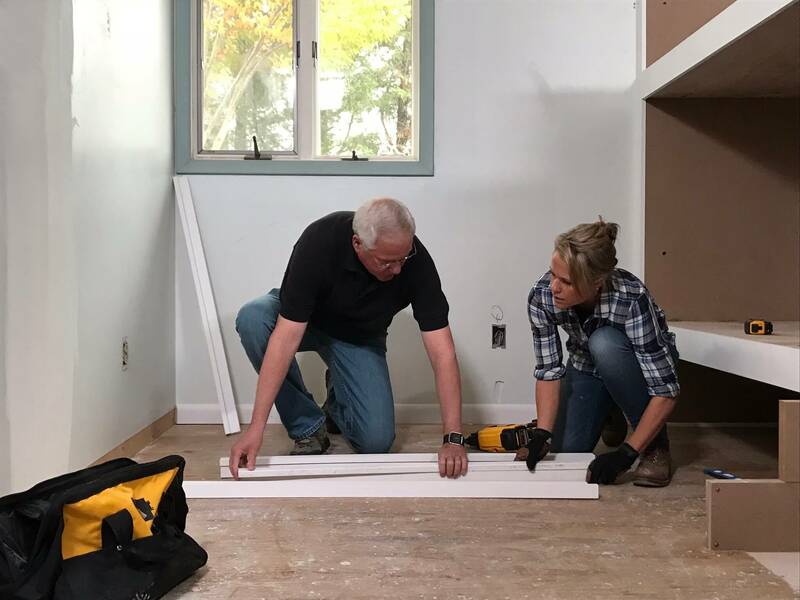 With the kitchen, I continued the work I began in the great room, expanding and reorienting the space to make it more welcoming and functional for a large family. I moved the kitchen to the opposite side of the room, and replaced all of the cabinets, appliances and fixtures. Just adding the white cabinets immediately brightened up the room! I added a wide peninsula with tall chairs, so family members could cook, sit and socialize all in the same place. The new kitchen is an extension of the great room that encourages sharing good food and conversation as a family. 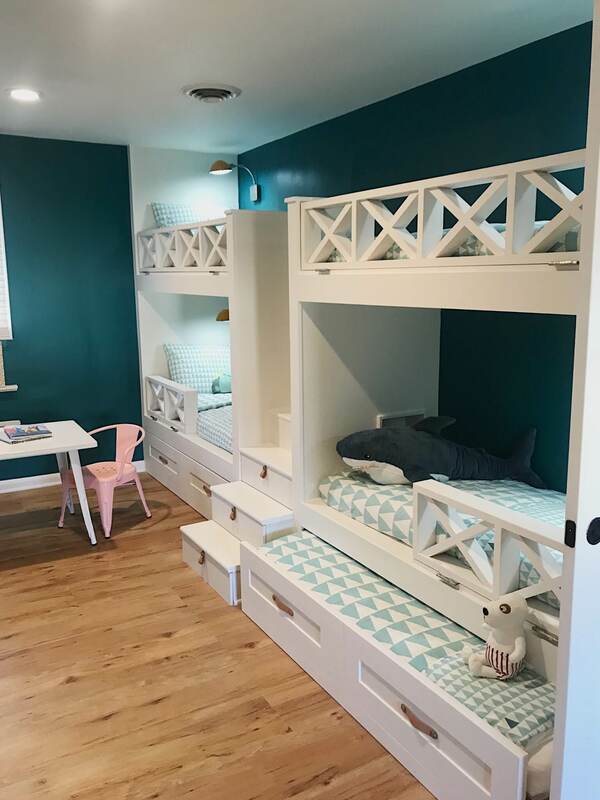 The family had outgrown the original kids’ room, which was sectioned off from the other rooms by a closet wall, and featured a queen-size bed. The room needed to sleep more kids in a limited amount of space. I removed the old closet doors, widening the opening to install double louvered pocket doors. This integrates the kids’ room more into the rest of the home, and gives it a bigger, less cluttered feeling. My signature double bunk beds were perfect for this space, providing a twofold increase in the number of sleeping spots, and adding storage drawers to boot! With its white walls, natural textures and nautical-inspired touches, the new kids’ room is vibrant and cheery. But because it has a classic look, the room will easily be able to adapt over time as the kids get older. A narrow full bathroom and an even smaller half-bathroom were crammed just off the kids’ room, and neither was very functional or practical. I reframed the walls to combine the two inadequate existing rooms into one roomy full bathroom, plus a handy laundry closet. 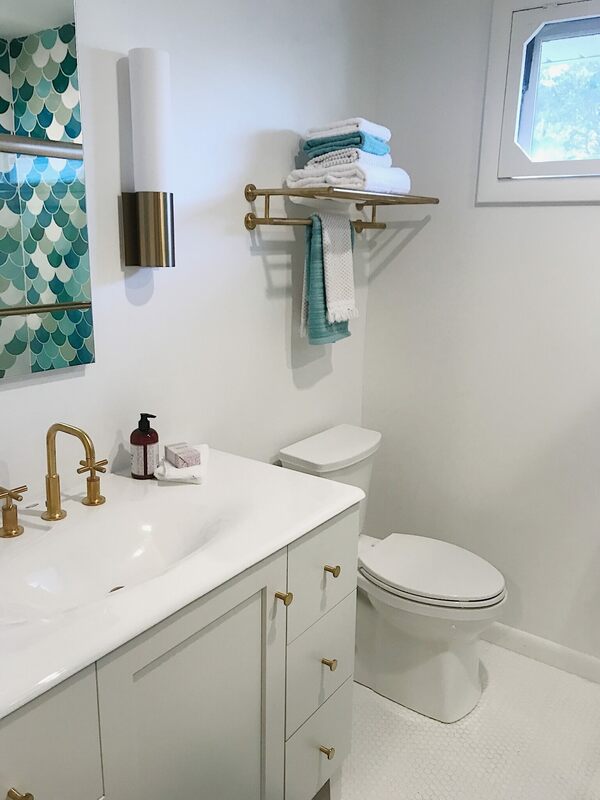 I put in a new vanity, elegant brass fixtures and accents, and beautiful tile in a blue-and-white fish scale pattern. The new bathroom has ample square footage and a chic aesthetic.